This vintage tax collector and notary public sign is a two-sided wooden exterior sign in the shape of a shield. It is hand-painted with Pennsylvania Dutch style flowers and letters in yellow, blue, red and green on white. There are holes on top that likely had chains attached for hanging. This sign belonged to Ruth S. Wetzel who recently passed away at 99-years-old. According to her obituary, she worked as the court clerk and liked cats and her daily glass of Thunderbird (a wine). She sounds wonderful. 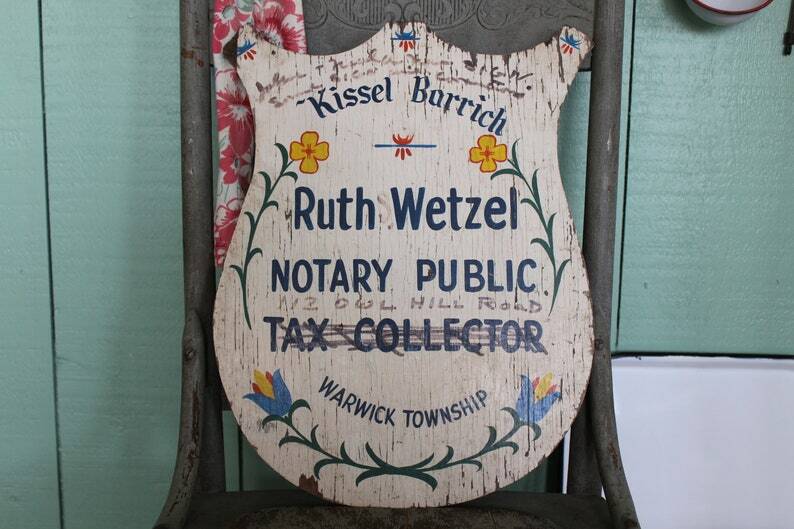 The sign says Kissel Barrich, Ruth S. Wetzel, Notary Public, 112 Owl Hill Road, Tax Collector, Warwick Township. I believe Kissel Barrich is a borough. Warwick Township is in Lancaster County (famous for the Amish) in Pennysylvania. Tax Collector is crossed out on one side in Magic Marker. Also in Magic Marker is what looks like instructions for a new sign, for the new clerk. This is an interesting piece of Pennsylvania history. It is also very decorative and would look sweet in your Scandinavian or Americana farmhouse kitchen, garden room, or country office. Having a play? Use it as a prop. It is in great vintage condition. There is wear, chippy paint and chips including some wood loss on the top left corner and on the bottom. Please use your zoom for a good look.